An SIU alumnus is using his two decades of industry experience to develop a promising partnership between his employer, Banterra Bank, and the College of Business. In March, Banterra Bank named Jeff Speith as its market executive for the bank’s central region. As a team leader for that region, Speith oversees the bank’s key locations in Southern Illinois, including Carbondale, Carterville, Du Quoin, Herrin, Marion, Mount Vernon and West Frankfort. Speith brings more than 20 years of industry experience to his new role. Speith first joined Banterra Bank in 1994 as an assistant branch manager. 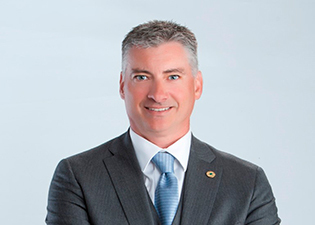 Between then and his return to Banterra Bank this year, he served in multiple leadership roles, including branch manager at First National Bank and Trust, senior vice president at Old National Bank and region president at Old National Bank. Speith received his bachelor’s degree in management and psychology from SIU in 1993, and an MBA in finance in 1997. He went on to get a degree from the BAI Graduate School of Banking at the University of Wisconsin-Madison, graduating at the top of the class in retail banking. In a phone interview, Speith detailed his vision of the opportunities SIU students have in Southern Illinois. Banterra Bank, headquartered in Marion, is the largest, locally-owned bank in the region, with $1.3 billion in assets and 36 branches in four states, including 26 in Southern Illinois. The bank, which recently opened a new location in Southeastern Missouri, hires employees from a highly diverse pool, but it values employees who plan to stay in the region. “Banking is about community investment,” Spieth said, elaborating that it means looking for ways to invest time and money to improve the community. He said community investment is one of the reasons banking is a rewarding experience for him. As an employer, Banterra Bank looks for graduates with good networking skills. Because personal relationships can potentially transform into professional ones, students who have established networks or demonstrate the ability to develop them are the some of the most desirable candidates, Speith said. He also said students who work or acquire volunteer experience in college display the traits of a strong work ethic, which is another factor crucial for success. Speith agreed with the assessment that the biggest strengths of the College of Business include students’ involvement with student organizations, as well as their participation in various professional trainings and workshops. During their time at SIU, students greatly improve their communication skills as they learn how to network and establish professional relationships. Speith noted the significance of both in today’s professional world – and particularly in the banking industry. He said that while advanced skills in technology are certainly valuable, the importance of communication skills is immense. Speith also said that he is encouraged by the College of Business’s efforts in continuing to make progress in educating students on how to properly communicate, both in writing and in person. Speith has participated on the Department of Finance External Advisory Board since 2002. He said he enjoys working with the College of Business and its alumni. He mentioned that having this network benefits him professionally – and that it also is an extremely rewarding experience. Since March, Speith has been working with a new team at Banterra Bank, and he said he has enjoyed mentoring his team. He added that leadership is about finding the people who can follow in your steps and do your work – and maybe do it even better. Speith said he finds leadership to be very rewarding. One of the things that Speith believes makes Banterra attractive as an employer is the fact that positions across all areas of banking are available in the region, which opens up even more opportunities to students interested in becoming accountants, financial analysts, human resource or marketing managers. More than 25 graduates of the College of Business work at regional Banterra Bank locations, and that is only the beginning of what looks like a promising partnership.